IN THE STUDIO THIS WEEK: HAPPY 18TH BIRTHDAY TO US!! 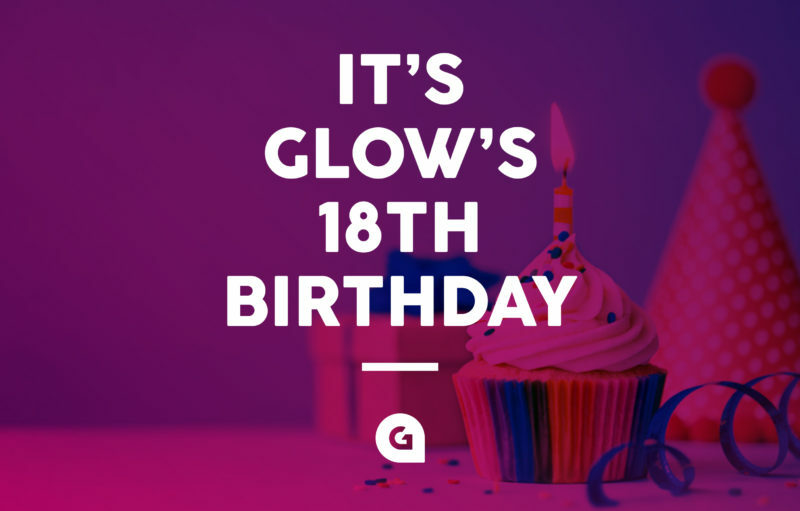 We’re celebrating this week as it’s Glow’s 18th Birthday! Glow officially turns 18 today, Friday 1 June! Glow was created back in the year 2000 (that doesn’t sound so long ago to us, but apparently it is if you’re our designer, Amy, who was only three at the time ). It was during the dot.com boom and not long after the world had recovered from the fear of the millennium bug and realised the predictions that we’d all be riding about on hover boards and in driverless cars were a bit premature – perhaps only 18 years premature though! Life was very different back in the year 2000…would you believe that Glow’s first ever logo wasn’t even pink, but green and purple? Our original website now belongs in a museum and the way we communicated was very different too – social media was in its infancy and Facebook, Twitter, LinkedIn, Instagram and YouTube didn’t even exist yet. Lisa Lavis, Glow’s Managing Director, has been at the helm since the very beginning and although we know she’ll blush and tell us off for writing this, she’s done an amazing job growing the business and steering it through some very tricky economic climates. Lisa’s personality and values have had a strong influence on Glow’s brand personality, and if you want to know a little more about where it all began and our journey so far, check out our ‘Glow is 18!` animation. Design has always been at the heart of Glow and is still our passion; we LOVE seeing our work shine, but before we start to get too sentimental, we want to say a quick thank you to all our clients of the past 18 years.